When you’re speaking in front of an audience, you’re almost always using a microphone. The point of the microphone is to help your audience hear you. But it can’t do that if you don’t know how to use it or if you actively work against it. Listen for your own voice. This is the key and basically subsumes all of my points below. You have to listen to your own voice coming through the speakers. Can’t hear it? Neither can your audience. Is it fading in and out? Same for your audience. This isn’t magic, it’s just a matter of some basic self-awareness. If you’re unsure if others can hear you, ask! “Can you hear me?” Watch not just for the people close to the podium, but the ones in the back. Are they giving you the thumbs-up or are they looking confused? Position of the microphone. It has to be close enough to your mouth to pick up your voice, but not too close. For a lapel mike, that means it needs to be high enough on your clothes, and of course not covered by anything. A handheld mike needs to not just be close to your mouth when you start speaking, but it needs to remain there. Gesturing, slowly lowering your hand as you speak, or pointing it in some random direction will all make the audience’s experience miserable. Your position. You need to stay close to the microphone. If you keep walking around or turning your head away from a fixed microphone, people still won’t be able to hear you. Even with a lapel mike, you need to figure out if it will pick up your voice when you turn your head, and not just blindly trust that it will always be able to hear you. Same as before, you need to keep listening to your voice as you move around or turn your head. Microphones are adjustable. You’re tall? You’re short? The previous speaker was much taller/shorter than you? Doesn’t matter, the microphone can be adjusted! Set it up for yourself. It needs to point at your moth and be as close as possible. Saying something to the effect of “I’m tall/short, so the mike doesn’t work” won’t help your audience. If there’s a problem, fix it. Popping noises. These are incredibly distracting and will work against you. It’s like spitting on your audience. Don’t do it. 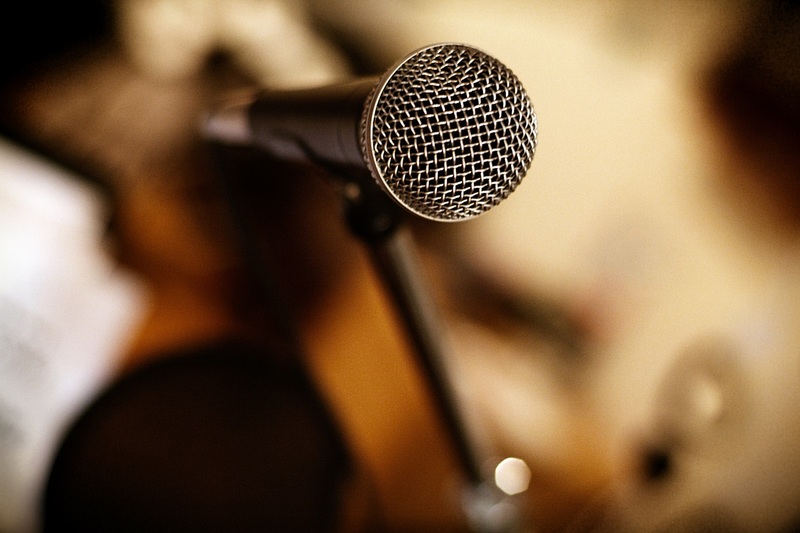 Listen to your voice and if you notice popping, adjust your microphone. Popping is caused by the little puffs of air you produce when you speak hitting the microphone. Just moving the microphone down a bit (or off to the side, but only a bit!) usually takes care of it. Speak up! Microphones and speakers amplify your voice, but that doesn’t mean you can mumble and whisper. I see so many talks that are barely audible because the speaker seems to think that the microphone can do magic. It can’t. It needs sufficient input from you to work well. What’s the point of giving a talk if people can’t hear you? If they’re straining to hear you at all, or if you’re annoying them with loud popping noises, they’re not going to listen to what you actually have to say. It doesn’t take much, just a few simple things to keep in mind (and observe in others!) will make a huge difference. See also my other posting about common speaking mistakes! This seems so obvious when you read it, but as an intermittent speaker I forget things like the microphone are just as important as all the effort I have put into the presentation. Great article! I would also add that “lapel” or “lav” mic placement can be a little tricky. For best sound, they should be located over your sternum — say between the second and third buttons down a collared shirt. Higher might seem better — closer to your mouth — but that can also place it in the shadow of your chin and cause it to be harder to understand. Similarly, if you literally attach it to a jacket lapel on one side, try to place it on the side you’ll be looking towards most often — the audience, the screen — since a lecturer is often not symmetrically placed and only looking straight out into the audience. At a conference, don’t worry about trying to hide the mic — that increases the odds that clothing will rub on it every time you move.